IS Student Survey: thanks for your feedback! Thank you to all who completed our annual IS Student Survey: there were over 1500 of you! 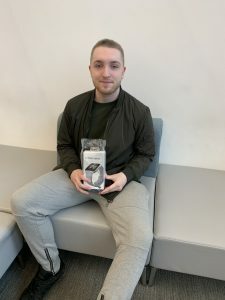 Well done to our survey prize draw winner Alex James Stacey who is now the proud owner of a Fitbit Versa. He was very pleased as he said he has never won anything! We are continuously seeking to improve our services and your feedback and suggestions are very important to us. You scored us at over 90% satisfied / very satisfied on student email, Moodle plus study space in the Drill Hall Library, Medway campus and over you were 85% satisfied / very satisfied on the availability and range of books and help desk service received in the Templeman Library plus website information. “When I have visited other university libraries while I have visited friends they haven’t been as welcoming, spacious and as effective in providing resources”. If you missed the chance to give us your thoughts, there are many ways you can get in touch! You can fill in an online feedback form or ask for a form at the Welcome Desk in the Templeman Library any time or drop us a line through social media. You requested better training and guidance on how to use e-books and e-journals – we are running ‘Your Digital Library’ campaigns again this year.